Confession: This is my worst ever vacation mistake but what is yours? Get ready to spill your beans. 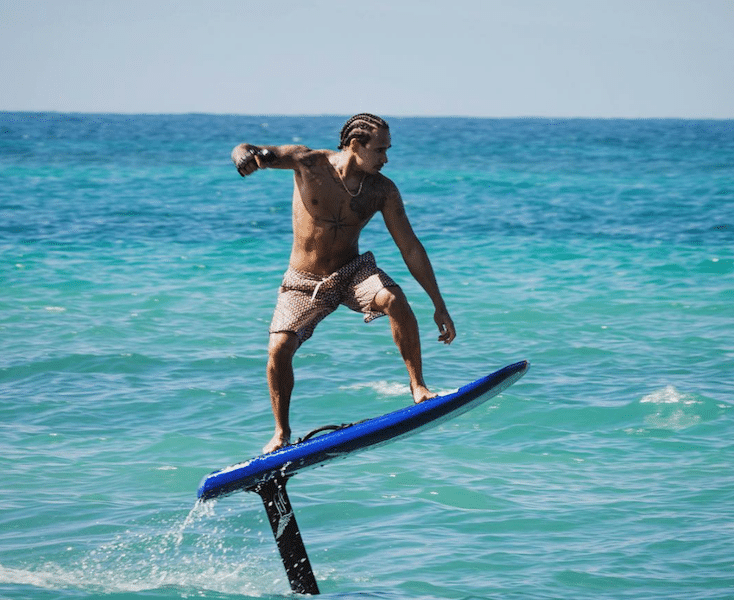 Watching adult learner and Formula 1 champion Lewis Hamilton discover how to surf, get barreled, have good style and foil board (so far) while on vacation has been a revelation for all of us or it least it has been a revelation for me. A beautiful, beautiful dance. Now, I don’t follow Formula 1 though I would like to. It feels like a sport for the upper upper crust. For those better than you and I which is probably exactly why I don’t follow. Because I haven’t been asked and the powers that be know that I don’t belong. Those powers are right but let’s get back to vacations here. Lewis Hamilton is absolutely crushing the vacation game but also falling into a traditional vacation trap. Sporting a vacation-specific hair-did that he likely got while on vacation. Have you ever gotten cornrows while in Bali? Be honest please. What about a henna tattoo? Honest. What about your name written on a grain or rice that you wore around your neck like a magical talisman? 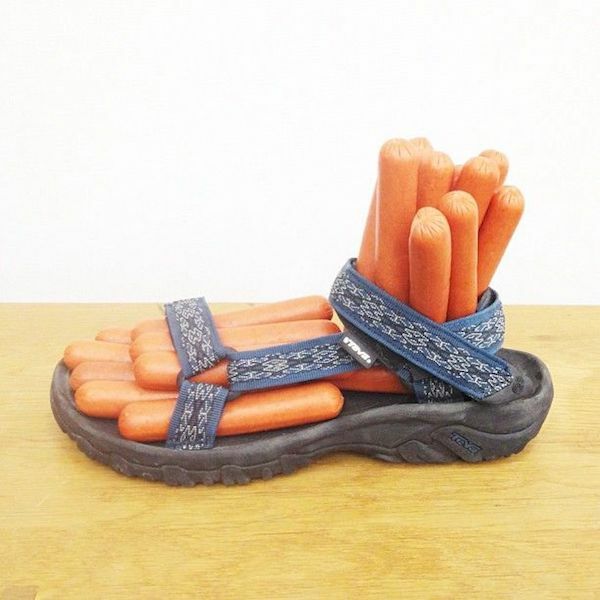 Because my worst ever vacation mistake was to buy and wear a pair of hot pink and teal Teva sandals when my grandma gave all the grandkids the option of either going on a snorkeling trip to Molokini or $50 cash during a family reunion to Maui when I was thirteen. I took the $50 cash and bought a pair of hot pink and teal Teva sandals and have basically regretted it for the rest of my life. Old enough to know better. Still too young to care. But now cough yours up. It is no more embarrassing than hot pink and teal Teva sandals over a fantastic snorkeling adventure. Adult learner and Formula 1 champ Lewis Hamilton now an expert at foil surfing! "This is fun! I can't get enough of it!" What did you do yesterday? Oh. That’s nice. 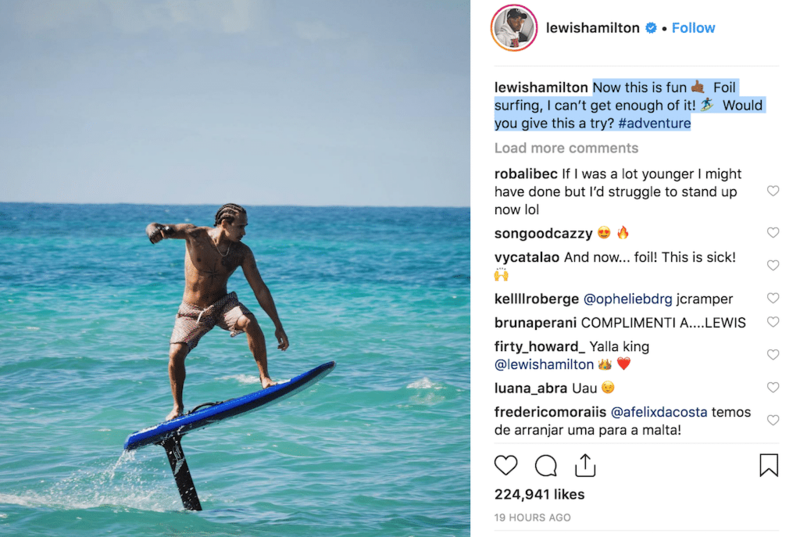 Well, adult learner and Formula 1 champion Lewis Hamilton learned to foil surf expertly. You think I’m mistaken because only two days ago he was learning to surf and only ten-ish days before that he was getting his very first barrel at Kelly Slater’s Surf Ranch? Well I suppose you don’t know Kai Lenny. The two have spent the month of January mocking conventional surf school curriculum and training techniques by taking a man who looks very much like Allen Iverson and transforming him not literally but figuratively into a multi-skilled waterman overnight. Normally I would respond, “No. I would not give that a try, damn it.” But look how stylish he looks. Look how poised. I know that his athletic frame is far different from my writerly one but can’t help dreaming. Can’t help picturing myself as an expert in something/anything. How long would it take Kai Lenny and Kelly Slater to teach me how to maximize every deduction on my taxes? Or center, level and hang a picture frame on a bare wall? Kelly Slater and Kai Lenny are the two best teachers in the world! It appears that Kelly Slater and Kai Lenny can transform any internationally-renowned, multiple-time Formula 1 champion and turn him into a surfer overnight. The best two teachers in the world? Although our sample is limited, I think the answer is a resounding yes! 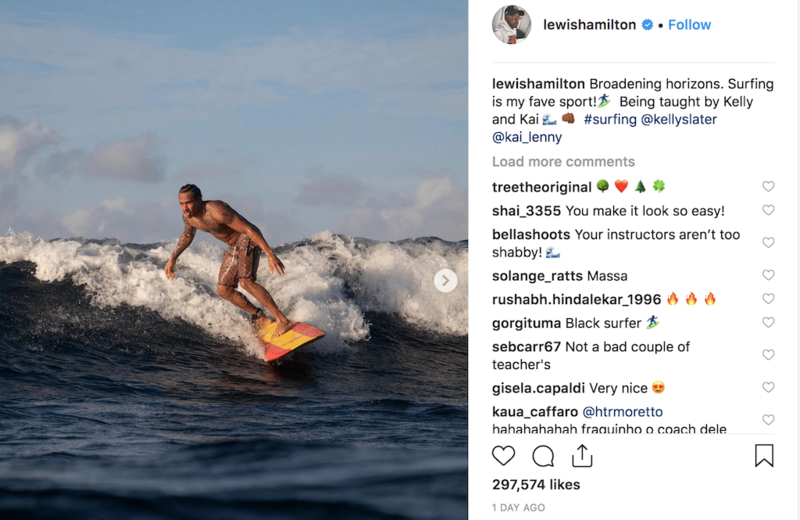 After getting barreled on his very first trip to Kelly Slater’s Surf Ranch just a few short weeks ago, the British racer Lewis Hamilton is back at it in the real ocean, this time with Kai Lenny though I think Kelly Slater is there too. No doubt. Hamilton looks confident, poised and ready to barrel in the real world. Face forward, shoulders squaring toward the wave, eyes down the line. The commenters agree that he is surfing extraordinarily. On it goes, not a bad comment in the bunch and does professional driving not have “grumpy locals?” Did the Father of Modern Professional Surfing accidentally buy the wrong pastime? James "Chappy" Jennings, snapped in the guts of Pipe by the peerless Don King. Three days ago, or thereabouts, Kelly Slater announced that he had seen the best photo ever taken at Pipeline. It was a shot of underground Pipe regular Kohl Christensen, snatched on a grapefruit sunset, by the photographer Daniel Russo, who was seated on a jetski. “This picture sums up why we surf. And nobody seems to be more in tune with the ocean than Kohl,” said Kelly. Russo ain’t one to claim thing, but he did say it was his best ever shot at Pipe. “Perception of one’s experience can vary from person to person. But this image is exactly what happened. To me, this is the exclamation mark of the winter at Pipeline,” said Russo. 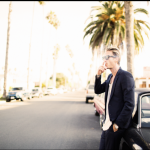 A roll call of noted surfers were quick to agree. And, Kelly Slater, of course. Chappy, for those who aren’t one hundred years old, is James Jennings, a surfer from Queensland who, despite being the size of an adolescent girl, was a marquee Quiksilver rider alongside Gary “Kong” Elkerton. 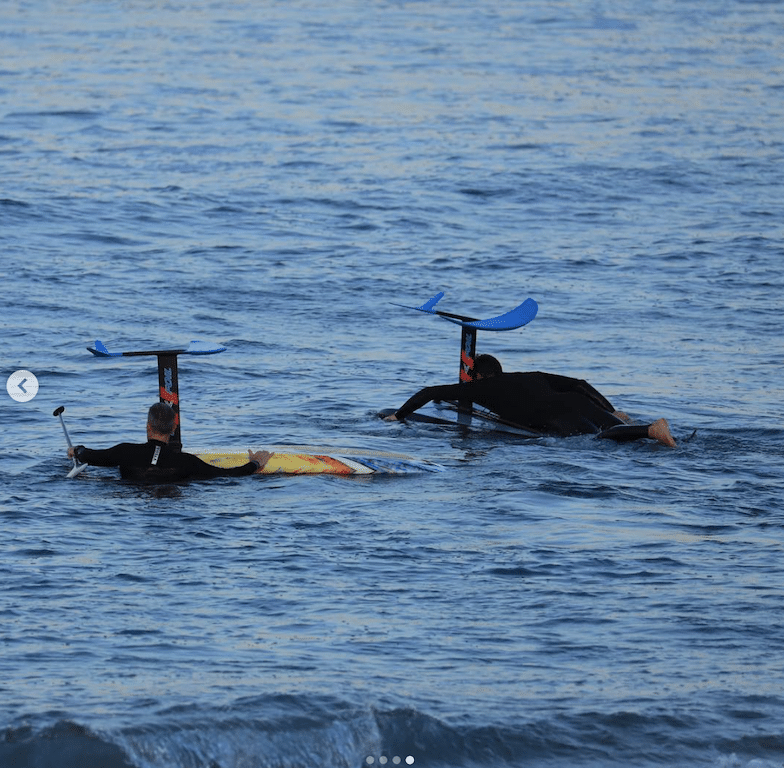 Apocalypse now: World Surf League president of content, media and studios takes on foil SUPping! So deadly it should come with a Parental Advisory warning! The very famous poet T.S. Eliot once mused, “This is the way the world ends. 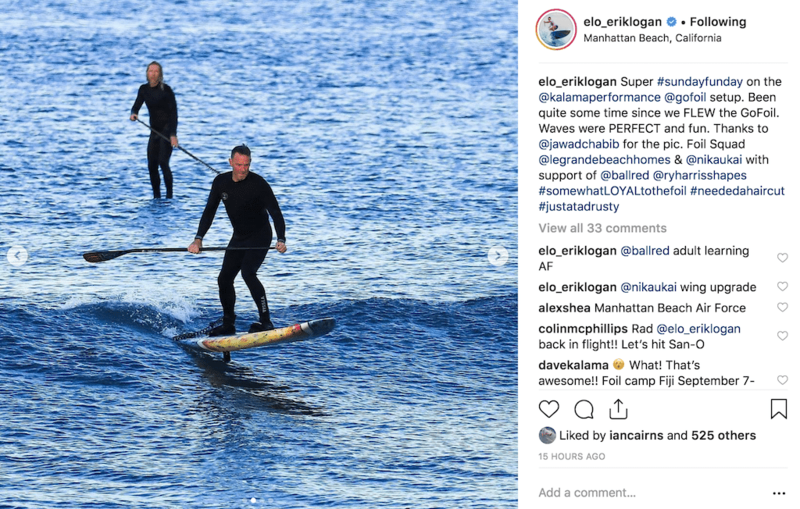 Not with a bang but a whimper.” and while I both appreciate the art form and the sentiment have to disagree for the world will neither end with a bang nor a whimper but with the sound of the World Surf League’s president of content, media and WSL Studio’s new SUP’s new foil sawing through your jugular vein. Or maybe a choked gasp. And what possessed our dear president of content, media and WSL studios to exchange his normal mode of transportation, the @infinity_sup #blurrV2, for 18th century France’s favorite tool? I cannot honestly say. I cannot even honestly speculate. Maybe there’s a clue in the hashtags? Like, why is “loyal” capitalized in #somewhatLOYALtothefoil? An acronym maybe? Lopping Off Your Auburn Locks? Is #needahaircut code for “I am going to scalp some folk today…” ? Would you rather surf knowing there is a Great White shark prowling around underneath or with President Logan next to you on a SUP foil? Adult learner and Formula 1 champ Lewis Hamilton declares, "Surfing is my fave sport!" Dorian, Healey, Kohl: "Wait! This is the best surf shot ever at Pipe!"